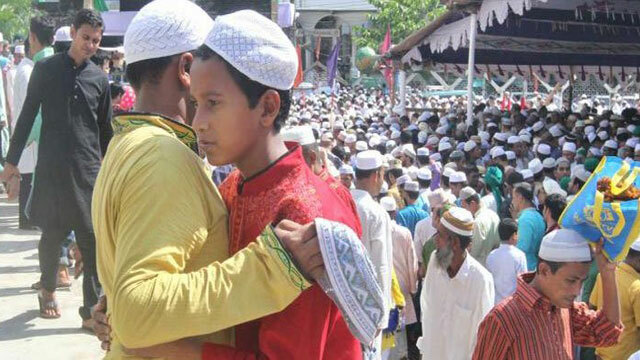 Dhaka, Aug 22 (Just News): Eid-ul-Azha celebrated across the country on Wednesday with great religious fervour and enthusiasm to commemorate the supreme sacrifice of Hazrat Ibrahim (AS). Millions of Muslims offered prayers in Eidgahs (open spaces) and mosques Wednesday morning all over the country, seeking divine blessings, peace and progress for the country. The main Eid-ul-Azha jamaat (congregation) was held at National Eidgah at 8:30am on Bangladesh Supreme Court premises in Dhaka. President Abdul Hamid, cabinet members, government high-ups, diplomats and non-government officials, among others, attended the Eid prayers. Strict security measures were taken to ensure safety and security at the Eidgah during the country’s prime Eid congregation. The devotees were not allowed to carry any bags at the prayer-ground. Besides, five Eid congregations were held at the Baitul Mukarram National Mosque at 7:00am, 8:00am, 9:00am, 10:00am and 10:45am. Following the Eid prayers, Muslims are performing rituals of sacrificing animals, spend their time feasting with family and friends and distribute sacrificial meat among their family members, friends, and the poor. The radio and television channels have chalked out a series of special programmes on the occasion of Eid.